In a medium bowl, combine the water, sugar, and espresso powder; stir until sugar and espresso powder are dissolved. Add cream cheese; whisk until smooth. Fold in whipped topping. Pipe or spoon cream cheese mixture atop cookies. If desired, chill for up to 4 hours. 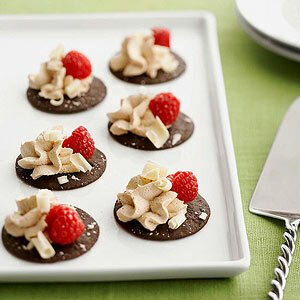 To serve, if desired, top with white chocolate curls and/or raspberries. *Sugar Substitutes: Choose from Splenda®Granular, Equal®Spoonful or packets, or Sweet 'N Low®bulk or packets. Follow package directions to use product amount equivalent to 1/2 teaspoon sugar. *Sugar Substitutes: PER SERVING WITH SUGAR SUBSTITUTE: Same as above, except 186 cal., 21 g carb.